All of the labels show the animal’s identification number, the place of slaughter and quartering, packing and best-before date, the part of the animal, the weight and health record. 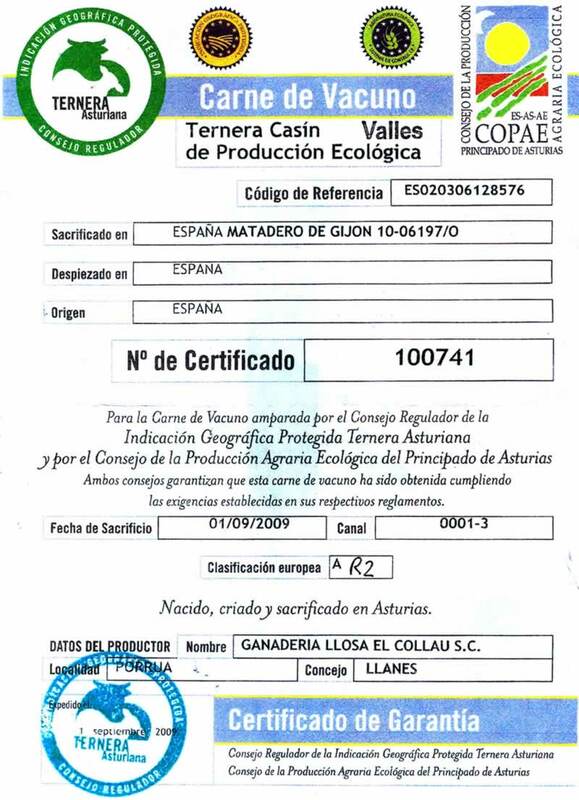 Each channel is accompanied by a joint certificate for the Asturian Beef PGI and COPAE, with both bodies guaranteeing that the meat has been obtained in compliance with the requirements established in their respective regulations. Storage: Vacuum packs last around one month in a refrigerator. To fully appreciate all the qualities of our meat, it should be removed from its packaging a few hours before consumption and left to air in a refrigerator. Remove 1 hour before cooking so that it reaches room temperature. 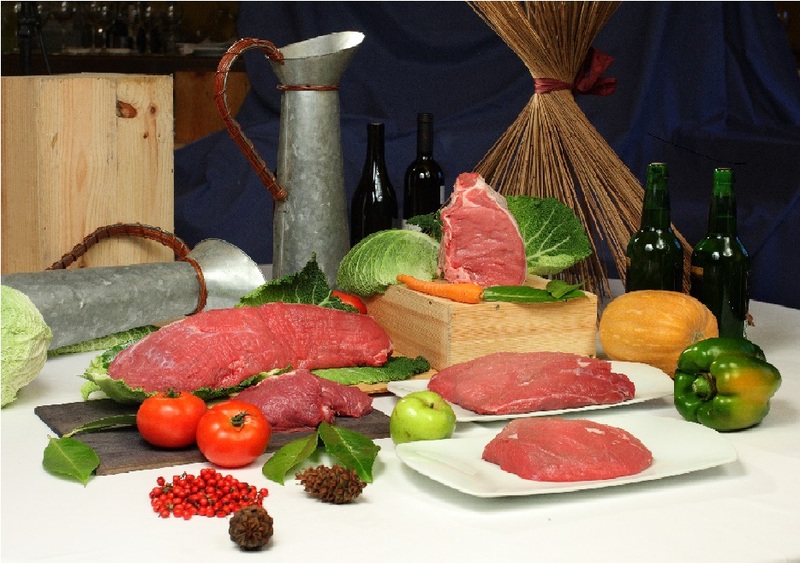 For recipes, visit the Asturian Beef PGI website. For customers who don’t have time, we have preserves where the meat is already cooked, ready to heat and ready to eat. Stew of Veal Asturiana Ecological traditional recipe, which evokes us the kitchen of the grandmothers. Ecological Asturian Veal stew with curry, for more adventurous palates. 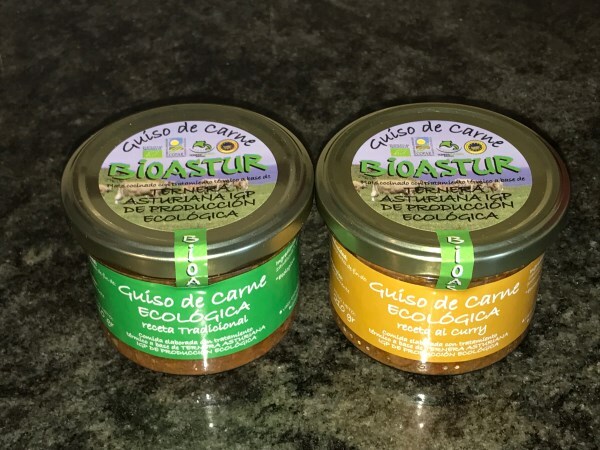 All the ingredients contained in the jars, in addition to meat, such as carrot, onion, oil …They are organic . Net weight 210 grs the jar and shelf life is 3 years. The meat is distributed by means of refrigerated transportation. The meat can also be delivered to the home, using refrigerated vehicles, sliced and filleted, vacuum packed in packs of 1/2 to 1 kilo, which ensures hygiene and prolongs the life of the product, with the animal identification, the corresponding part and Quality certificates (front and back labels; COPAE and IGP seals), accrediting the origin and management of the livestock. This delivery method, ideal for sharing among friends or family, is aimed at making distribution cheaper and enables us to reach the client with an exceptional product at an affordable price. Orders of 12 kilos facilitate the process, making distribution cheaper and benefiting the final consumer. Delivery times range between 7 and 15 days, which is the time required to complete the order and prepare the meat. To place an order, a reservation fee must be paid, which is then discounted from the final bill. The aim of this is to avoid pointless slaughtering, since we do not have the infrastructure (butchers, warehouses) to divert orders to other sales channels. For restaurants and shops that can guarantee a regular order, there are other prices depending on the size of the order.